The options that are used during the vectorization process are based on vectorization styles. You can select a preset from a list, or customize your own. Use this style to vectorize black and white (1-bit) SCAN, or any other black and white files. Black and white 1-bit files include no texture information. When you vectorize black and white drawings with these options, the vector files will contain no texture (-no_texture); all lines will be solid. These options also remove holes, (-rmv_holes 7) and dirt, (-rmv_dirt 10) of specific sizes. The fit_errorl and fit_errorc options also filter the contours that form ink lines and colour art so that they are smoother. This style vectorizes black and white 1-bit files that will be used as mattes to build tone and highlight effects. These options prohibit the creation of line textures, remove holes and dirt, and smooth final drawings. These options also remove triangles (-no_break) at the intersection of lines in the line art. Triangles are useful at intersections if the intersecting lines are to be painted using different colours. This is unnecessary in drawings, like mattes, that will be painted a solid colour. This style vectorizes greyscale drawings, maintaining the rough textures in the lines. 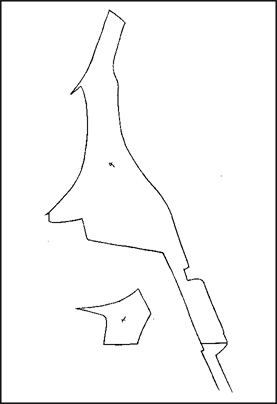 As you can see in the example below, the drawing gets its character from the roughness of its lines. You would not want to lose the distinctness of the line during the vectorization process. The options in this style force two passes of the vectorization process to apply different values to the line art and colour art (-2pass). You must specify values for the line art and colour art when you use this option. 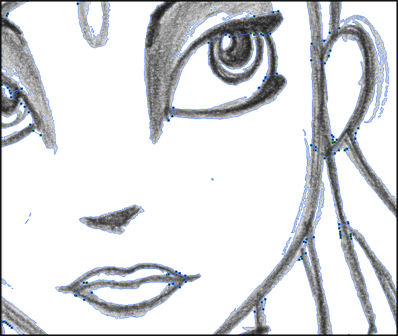 For drawings with specific vector-style lines or mattes, you only need one pass. For greyscale drawings, you may want to pass through the vectorization process twice to apply different values to the line art and colour art. The colour art (-threshc) and line art (-threshl) thresholds determine what values in the scanned image will be considered as part of the drawing, and what will be ignored and eliminated in the vectorized drawing. Zero (0) is white and one (1) is black. The threshold is between these two values. The expand_bitmap and jag_filter options work together so that you can pick up noise, or small pencil lines and marks, during the vectorization process. The expand_bitmap option expands the bitmap to pick up the noise. When used with jag_filter, the bitmap is shrunk down by the value of the option. You use these two options together to maintain the size of your line art. The fit_error options smooth ink lines and colour art strokes. The rmv_holes and rmv_dirt options remove hair and dirt of a specific size from the line art and colour art. The rmv_hairs option removes tiny strokes that extend from main colour art strokes. And, rmv_triangles option removes triangles and intersections that are less than the specified distance apart. Use this vectorize style when you want to create a vector image with fine, textured strokes. 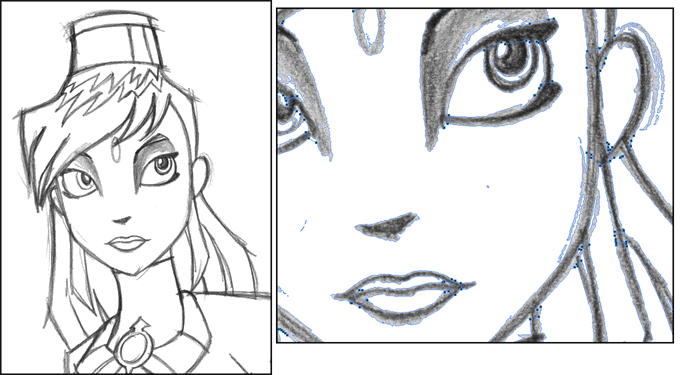 Unlike the Grayscale rougher lines style, this style is meant for more subtle line variations. -thresh values are smaller; therefore, fewer pixels will be filtered out.This contributes to the fluffier appearance of the lines. You will also notice that the fit_error value is smaller and the -expand_bitmap value is larger. All of these options contribute to the smoother appearance of the final line.